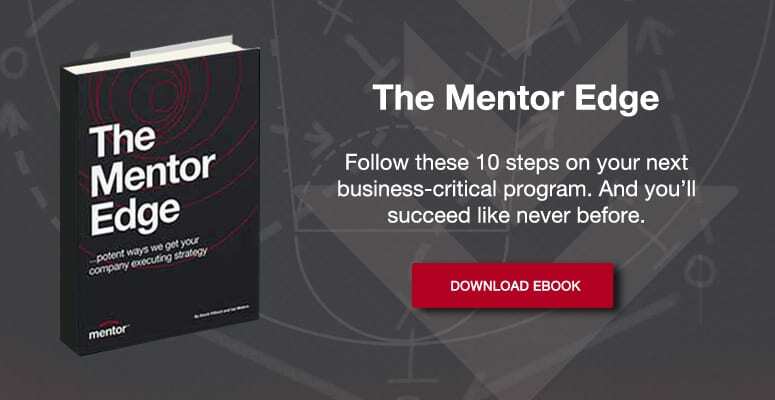 Catapult your strategy execution to the next level - Mentor Europe . Classically, strategy is too abstract and too shallow. As a result, it’s not well understood by the people who have to implement it. A basic problem is managers know more about planning than doing. Managers are trained to plan, not to execute plans. In many organisations, there is a separation between ‘planning’ and ‘doing’ – which is a huge problem. Strategy plans are ‘thrown over the wall’ to the doers – mostly by PowerPoint – so that planners can get on with more exciting stuff. This behaviour is corrosive for the entire business. Compounding the problem, companies focus on too many things at the same time. No company can concentrate on more than three or four critical issues at one time. Attempting to focus on more is a widespread problem. Any manager who says he has ten priorities to juggle with has lost sight of what the important issues are. The simpler the view of what you have to do, the more focus you will have. Execution failure is not a single shattering event. It doesn't happen overnight. Just because nothing bad happens in week two or month two of a program, doesn't mean disaster is not on its way. It’s a few errors in judgement, repeated every day, that eventually lead to an execution debacle. What are the main cornerstones of successful execution? Does it require great intelligence or technical ability? Execution success comes from the simple discipline of doing ordinary things exceptionally well. The difficulty is these simple disciplines are easy not to do. Time after time, this is the root cause of the mess we see in execution. Being precise on the critical issue is vital to success. This clarifies expectations and eliminates the vagueness that people get away with in everyday conversation. Objectives and outcomes need to be succinct and written down unambiguously. People involved in the execution process should not be required to read between the lines. Plain talk is not easily achieved. Managers, at every level, are prisoners of the notion that a simple style reflects a simple mind. Actually, a simple style is the result of hard work and hard thinking. Written plainly and simply, clear expectations and specific outcomes are the first critical step in creating a successful execution plan. It takes real effort to be concise. There are so many things that a company can’t control, from the economy to the competition, you would think they would pay more attention to the one thing they can control – the quality of people in the execution and team. But it’s taken for granted in many companies. Every key execution job should be defined in terms of three or four mandatory requirements – things the person must be able to do to succeed. Knowing execution hazards is incredibly important, but it’s not enough. If you want a team that performs well, you need to match people to each task. Execution teams need diverse skills. Managers who make sure that they have a good match between their people and goals - before they take action. This doubles the chances of successful follow through. Milestones bring a strategy to life. Yet it’s still surprising how many major ‘plans’ are described in a few obscure paragraphs, accompanied by a worthless Bar Chart. Milestone plans are important, especially where the program is large and complex - a schedule of key activities is crucial. A time has to be agreed for specific things to happen, otherwise they won’t. Everyone should see how their efforts fit into the whole and invest time in integrating their pieces of work with the others. Until you have that, it’s impossible to see the connections and dependencies across the business. Plans can’t protect you from bad strategies, bad leadership, unclear goals and bad communication, but they do provide a crucial road map for execution success. Failure to follow through is widespread in business and a major cause of poor execution. You have to have meaningful controls and a dynamic review process. An execution culture relies on robust debate. This means a climate where there is a frank and open exchange. We have all been in meaningless meeting where there is no intensity in the review process. Issues are fudged by silent lies, misleading comments and flagrant untruths. No one is willing to say the emperor has no clothes. Realism is at the heart of execution. Organisations are full of people who want to avoid reality. Reality makes them feel uncomfortable. Executives must be prepared to deal with difficult situations. What matters most is how executives deal with a ‘crisis’. The first thing to do is to establish the brutal facts – to ask tons of questions. And there’s a skill in asking these questions. But you have to be intent on getting the plain, unvarnished truth. ‘What’, ‘when’, ‘how’, ‘where’ and ‘who’ are very powerful questions. They force people to be specific - to reveal what they actually know for a ‘fact’. It’s then easy to separate real knowledge from wishful thinking. ‘Why’ lacks precision and should be used sparingly. It can be a useful question but it encourages people to rationalise things in hindsight and to play down the seriousness of situations. Execution is not rocket science but it is a neglected management discipline. Business management education reveres strategic planning - but execution skills have to be learned on the job. Managers can get away with ignoring the disciplines for weeks or months without any obvious sign of problems. Strategy execution is prone to collapse unless teams have the experience, process, and talent to implement the strategies. The disciplines are easy not to do – but if this normal practice, disaster is never far away. Management literature admires companies who are considered to be good ‘examples’ of execution – so called models of excellence. Equally, there are companies who serve as ‘warnings’ – these are behaviours to avoid. Experts encourage us to be like the ‘examples’ and not like the ‘warnings’. When a book is written about your company, make sure your business stands out because it is an ‘example’ – and not a ‘warning’. Why do many businesses put so much effort into crafting the ‘perfect’ strategy and then screw it up with slapdash approaches to execution? Strategy execution is not well managed in many companies – and poor ‘execution’ is much more damaging to a senior executive’s career than lack of strategic insight. The cost of the problem is astonishing. Execution is about ‘getting things done’ but the low number of successes suggests it’s much easier to talk about than to actually ‘do’ it. Strategy can’t be left to chance. No strategy can deliver results until it’s converted into intentional actions. ‘Conversion’ is a disciplined process that takes a well-crafted strategy and makes it work. A huge number of plans don’t deliver what they promise. There’s a chasm between what’s said and what actually happens. Initiatives fail because managers use flawed approaches to follow through. But, let’s face it, execution is very difficult. The barriers to success can be formidable. To understand why execution is tough, we need to grasp a key feature of the strategy task. Strategy planning is normally carried out by a handful of people over a short period – sometimes just a few weeks. By contrast, execution of the strategy is played out over a much longer period, usually involving hundreds, perhaps thousands, of people. What’s more, the strategy task tends to be restricted to a few senior managers and it’s not widely shared. But countless strategies are designed without first gauging the organisation’s ability to execute them. Execution failure is not a single shattering event. It doesn’t happen overnight. Just because nothing bad happens in week two or month two of a program, doesn’t mean disaster is not on its way. It’s a few errors in judgement, repeated every day, that eventually lead to an execution debacle. Execution teams need diverse skills. Managers who make sure that they have a good match between their people and goals – before they take action. This doubles the chances of successful follow through. Milestone plans are important, especially where the program is large and complex – a schedule of key activities is crucial. A time has to be agreed for specific things to happen, otherwise they won’t. ‘What’, ‘when’, ‘how’, ‘where’ and ‘who’ are very powerful questions. They force people to be specific – to reveal what they actually know for a ‘fact’. It’s then easy to separate real knowledge from wishful thinking. Business management education reveres strategic planning – but execution skills have to be learned on the job.